If we look at lights through a dirty window at night – haloes appear. The haloes are not real, but “appear” to be real. Appearances may not be reality, so don’t be fooled. 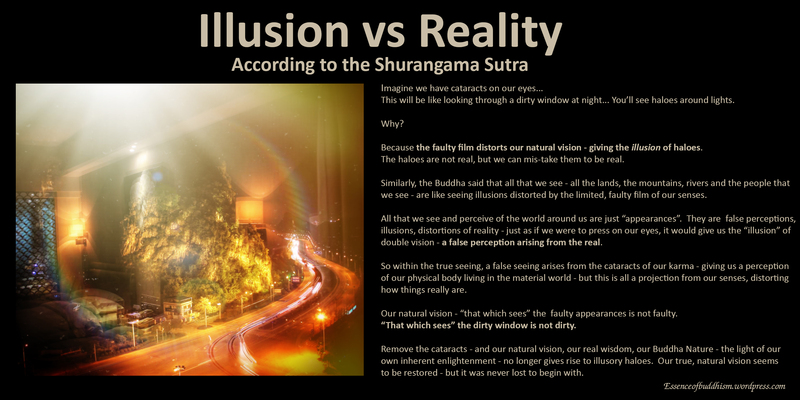 In the Shurangama Sutra, the Buddha reveals that what we take to be the real world may not be real at all, but rather distorted perceptions of reality arising from perceiving the world through our body and its senses – he called this the false perceptions arising from individual karma. Using the analogy of a person with cataracts who sees the illusion of haloes around lights at night, the Buddha says that we have mistaken a thief for our own son. We have taken appearances to be reality in the same way that the haloes are not real, but can seem real to someone with cataracts. However, once the cataracts are removed, no more haloes are seen. That which perceives the faulty film is not faulty. This entry was posted in Uncategorized and tagged appearance vs reality, Buddha, Buddhism, cataracts, Dharma, diseased film, distorted perceptions of reality, distorted reality, film, haloes, illusion vs reality, lamp, light, Shurangama Sutra. Bookmark the permalink. I really enjoyed your post. Thanks for sharing! Hopefully my posts will make a little bit of a difference to all of you in an effort to help you guys see the real Dharma for yourselves!